Jacketed quadrapod structure with 4 pinpiles each of 1m diameter penetrating 9m into bedrock. 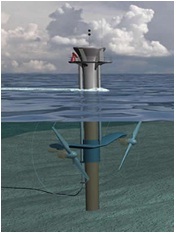 SeaGen can also be supplied on a 3.5m monopile and its predecessor the 300kW Seaflow was installed on a 2.1m diameter monopile. This page was last modified on 20 May 2014, at 15:59.